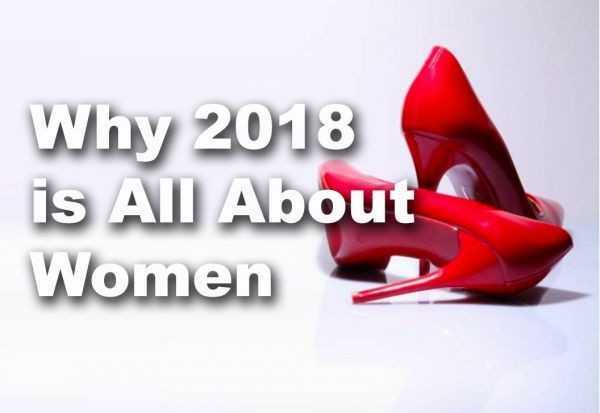 2017 planted the seeds and nurtured enough young plants to make it clear that 2018 would be all about women. Last year we marched as a protest chant, worried about our collective civil rights, about our equal rights to good healthcare, about our reproductive rights, and about our rights to parental leave. We were worried about the environment, racism, bigotry, and patriarchy, and we were worried that our voices would be suppressed. Today we are all still worried about the same issues, but we know that we are being heard and that we are making the waves for a lot of change. We only have to look at how the #MeToo movement suddenly gained momentum: women (and men) have shown that they are not ready to let sexual harassment and assault pass under the radar anymore. We are taking action by calling out perpetrators, even the incredibly powerful ones, and educating our children to understand and enforce consent and boundaries. 2018 will be the year when we will see that significant changes are made when it comes to reporting harassment and abuse, and hopefully a pathway to making real change in what has been centuries of patriarchy and silence. While the movement was mainly focused on Hollywood in 2017, it spans across all industries, and is moving rapidly to include everyone. Courageous women and men who have been fighting for new laws to be put in place for years are finally seeing their work being rewarded. Activists are becoming the Wonder Women of 2018. This isn’t a new fight, but it has finally been blasted into the spotlight: we are talking about sexism and it’s not going to be swept under the rug anymore. Time Magazine named the #MeToo movement, the Silence Breakers, as their Person of the Year in 2017. Participants at the Golden Globe ceremony earlier this month dressed in black as a way to show their support with the movement, seven predominant actresses invited seven activists as their guests, and Oprah Winfrey won the night with her empowering speech. While victim blaming still seems to be pretty rampant, interesting discussions about boundaries, and what harassment and coercion really mean, have been popping up all over social media. This is really opening the doors to a more widespread understanding of not only how harassment and assault are all too frequently silenced and normalized, but also how we can really use these discussions to educate, heal, and advocate for real change. 2018 also happens to be the 100 year anniversary of the women’s right to vote in the UK (it happened three years later in the US). In light of these suffrage anniversaries it is quite poignant to see a huge rise of politically active women all over the world. Slowly but surely our governmental bodies will start representing more female and diverse voices over the next few years, and who is to say that we won’t see a female US president in 2020? Over the past year there has been a great rise in the number of women who are running for office, setting a great example for the next generations to come. Women are empowering each other to use their voices in places where they have rarely been represented accurately in the past. This empowerment also seems to be creating a new wave of activism and action in today’s youth, as they are learning that there is power in speaking out and standing up. Publications such as Teen Vogue are reacting to this by offering thought-provoking and intelligent content that even adults appreciate. With activists becoming as famous as movie stars, and popular artists taking a stance on social issues, tweens and teens are noticing that it’s OK to speak up about things they are concerned about. Over in the UK large companies now have to report gender pay gaps to the public, and also do the work towards improving this pay gap. This is a huge positive for women who have been fighting for many years for equal pay in the work place. While this is isn’t yet in the works in the US, it is another issue that is constantly brought up in news articles and protests. If we are doing the same work as a man then why are we not getting the same pay? Just recently Catt Sadler, E! News anchor, quit her position because she learnt that she was making only half of what her male co-host was making. I’m pretty sure we will be seeing a lot more of this in 2018, especially if companies don’t start being more transparent in how they pay their employees. Kudos to the UK for making this happen! And so this year we will march because we know our voices will be heard, and because we will continue to push for change. And right there by our sides will be the men who also believe in equality, change, and social justice! 2018 will be all about women standing up, empowering each other, and making our voices heard. Mamas, Take Care of Your Teeth!